“Aura Mastermind” is a program in which selected applicants learn from successful and honorable mentors, drawn from David Tian’s personal peer group. Selected applicants receive personalized coaching, support, and mentorship. Insider information will be shared as well as forging alliances and connections. 1. Bring together successful men in various areas of life to share strategies, and offer guidance and advice. 2. Nurture alliances, partnerships, and connections to increase the level of success, lifestyle, and fulfillment. 3. Create a support group of confident, masculine men who understand the struggles, challenges, and triumphs of mastering various aspects of life. 4. Create a peer accountability group that holds its members accountable to achieving their highest potential in life. The program is designed as Mastermind Summits presented in lessons and materials, as well as knowledge and research from special guest speakers in their fields of expertise. You will receive focused strategy regarding your past, future, and planning the direction of your life. It is recommended that you attend at least two Summits during your 12-month membership. Learn how to discover, connect with, and sustain your dream vision of sensual and romantic love. Master your social life and create an enriching social circle. Unleash the potential and power of your conscious and unconscious mind to fulfill your dream destiny. Learn how to control your emotions in order to realize your goals and lead you to happiness. You will be equipped with proven strategies and insights to enhance the quality of your life. Learn how to renew your energy with fitness, health, and psychological strategies. Summits given four times a year. It is recommended that you attend at least two summits during your 12-month membership. A customized, private coaching program with Dr. David Tian. You will be given a private coaching program of eight sessions during the year, plus follow up. A live coaching call every week. This accountability group is designed to provide group to support you every step of the way. Access to online Aura Transformation training programs. As a Mastermind member, you can become friends with bright, powerful, confident, emotionally intelligent, masculine men. Designed to get your questions answered by a Mastermind adviser or a fellow member. Receive free VIP access to Aura Transformation Academy events and live trainings. Fill out and submit online application form, which takes you to the deposit form. A 100% refundable deposit of 100 USD is required. The deposit guarantees your application appointment. 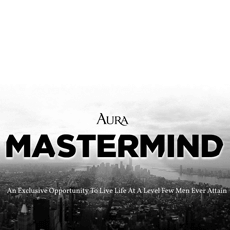 If you are not offered a membership or you choose not to join Aura Mastermind, your full deposit will be returned. After placing your deposit, you will be taken to an appointment scheduling page to choose your application appointment time slot. If there are no convenient time slots, email [email protected] to arrange a convenient time for you. Applications for Aura Mastermind require a live interview, usually conducted over Skype, to discuss whether you are a good fit for the program, and answer questions. All Summits are conducted over a weekend and held in luxury hotels. The Aura Mastermind consists of two groups, maximum capacity 12 client members each. It is highly recommended that you have already taken an Aura Transformation online training program (e.g. Limitless, Invincible, 10 Weeks to Freedom, or Awakenings). Exceptions will be made. Allow up to 7 business days for approval.